I’m always on the lookout for good sausage. Living in Central Texas makes this pursuit easy as pie what with all the Czech, Austrian and German emigrees residing within 100 miles in any direction you care to drive. That’s another subject altogether as today we’re going to discuss patty sausage, the kind that Jimmy Dean made famous and sadly, the kind that’s really difficult to find in Austin proper. Historically the 12th and Chicon neighborhood where Galloway has, for the past 12 or so years, been known more for its open air drug and prostitution market than its delicious foods. Til a couple months ago when Austin Police started a neighborhood crackdown straight out of a Richard Pryor stand-up piece. Basically if you were caught strolling around this vaunted quarter you were subject to being commanded at taser point: “PUT YOUR HANDS UP-PULL YOUR PANTS DOWN AND SPREAD YOUR CHEEKS”. Making my way through the neighborhood over the last few weeks on my way to eat at Galloway or nearby Sam’s Barbecue, I’ve been privy to scenes straight out of the Wire: Hookers flat trucking it with po po in hot pursuit, young bucks running pell mell down the alleys with po po in hot pursuit, and broke down oldsters too beat up to run just being straight man handled by po po. The message was clear: Business as you used to know it is over. On to the food. Galloway does indeed put out a very fine Southern breakfast. The fried eggs are cooked perfectly over medium and the grits slow simmered with plenty butter and salt, But it’s the sausage that keeps me coming back. This is hand-patted, seasoned in the house, deliciousness. The finest I’ve found in Austin. The hospitality of the Galloway clan is the icing on the cake. Stephen Galloway is a soft-voiced, earnest restaurateur. He knows the hospitality side of the industry, and with his wife and mom backing him up in the kitchen he’s got the victuals covered too. If you’re of a mind for some soul food in Austin this is where the conversation begins. 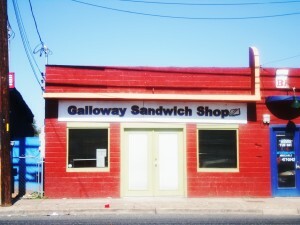 This entry was posted in Austin Texas and tagged Austin, austin texas, breakfast, east austin, galloway sandwich shop, texas. Bookmark the permalink.